This really is your last chance to receive a FREE Classic Drinks Package as well as reduced pricing on a large selection of Celebrity Cruises for 2017. You have up until 6pm Wednesday 30 November 2016 to book with Cruise365 or you will miss out. I have noticed that Mediterranean Cruises on Celebrity have increased massively over the last few weeks (in some cases but over £500 per person) and this is all down to demand. Celebrity Cruises decided to redeploy Celebrity Equinox to the Caribbean for Summer 2016 meaning that Celebrity will only have 4 ships in in Europe next year. Celebrity Eclipse offers a full season from Southampton. Celebrity Reflection sails the Mediterranean from Rome on either a Western Med or Greek Islands Itinerary. Celebrity Constellation dots around the Med with exciting itineraries as well as the chance to Jet Set Sail on selected dates with private flights and extra benefits. Celebrity Silhouette sails Northern Europe from May to September & the Mediterranean in the Autumn. Cruise365 do have some fabulous September and October Fly Cruise prices on Constellation with Balcony Staterooms £1599 including the Classic Drinks Package plus and additional On Board Spend. I am concerned at availability on other dates as Balcony staterooms and above have very limited availability. Drinks packages on Cruise365’s special Caribbean Offers, Far East Offers, Suez Canal as well as Australia & New Zealand Offers also end on Wednesday. Celebrity Cruises Classic Drinks Package is one of the most comprehensive at sea and the link below will show you just what is included (there are enough drinks to hydrate you as well as dehydrate you !). I hope this information is useful and please do not hesitate to contact Lindsay, Helen, Amanda, Jill or myself on 01388 767 222 and let us handcraft you a Modern Luxury Style Cruise with FREE Drinks before its too late. Cruise365 have been handcrafting Cruise and Stay holidays since 1998. Our experienced, friendly team are just a phone call away to help you make the right decision for cruise holidays all over the globe. Not only do we inspire you with ideas gained through experience and knowledge we also save you £££’s as we are able to link the best airline prices with the best hotel & cruise prices. Call the Cruise365 team on 01388 767 222 and let us handcraft you a memorable cruise holiday. Award winning Cruise365 is one of the UK’s most experienced cruise specialist companies. Founded by Anthony Blackmore in 1998, Cruise365 has gained the reputation for offering luxury cruises at bargain prices. From the origins of an American specialist operation, the company was at the forefront of developing repackaged cruise holidays giving people more choice and options to customise their holiday to their own specifications, thus resulting in greater value holidays. I’m sure our regular guests will have notice that our website is currently evolving into a more inspiration site with a focus on being able to find the best and relevant offers quicker and easier. The team at Cruise365 have always been focused on handcrafting amazing cruise holidays with inspiring add on opti0ns. We have prided ourselves on the choice of cruises we offer at amazing prices. We have gone back to our roots with our evolving site and have put the ease of finding the best offers as a priority rather than having endless live fed irrelevant cruise options. As an addition we have added the ‘Inspiration Station’ 12 informative blocks of Cruise Ideas. If you do not see your chosen cruise offer or destination call 01388 767 222 as it will take a few weeks for all of our handcrafted cruise options to appear on the new Cruise365 site (lets face it handcrafting offers helps us inspire you with the hidden gems available in the world of cruising). 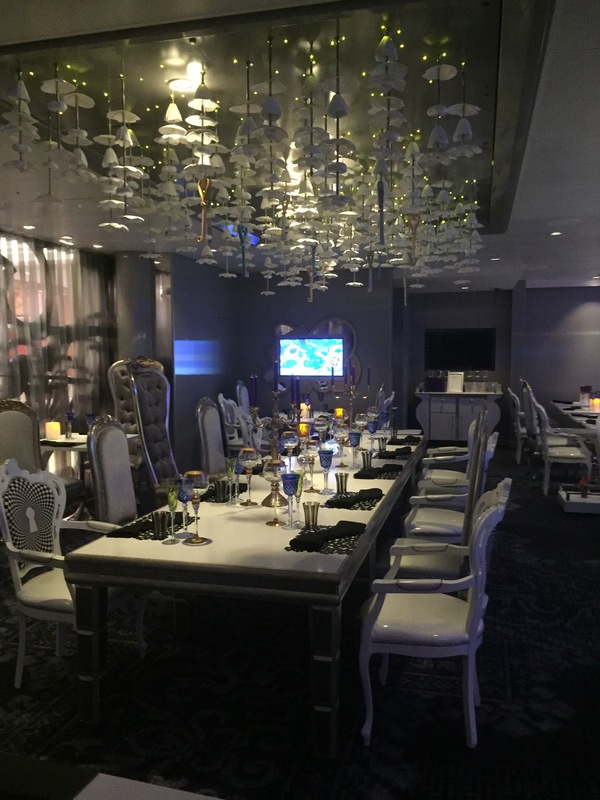 For the full Quantum of the Seas experience I would recommend that guests try at least one of the speciality restaurants. Classic favourites such as Chop Grill and Izumi sushi are onboard as well new concepts including Jamie’s Italian by Jamie Oliver and Wonderland. 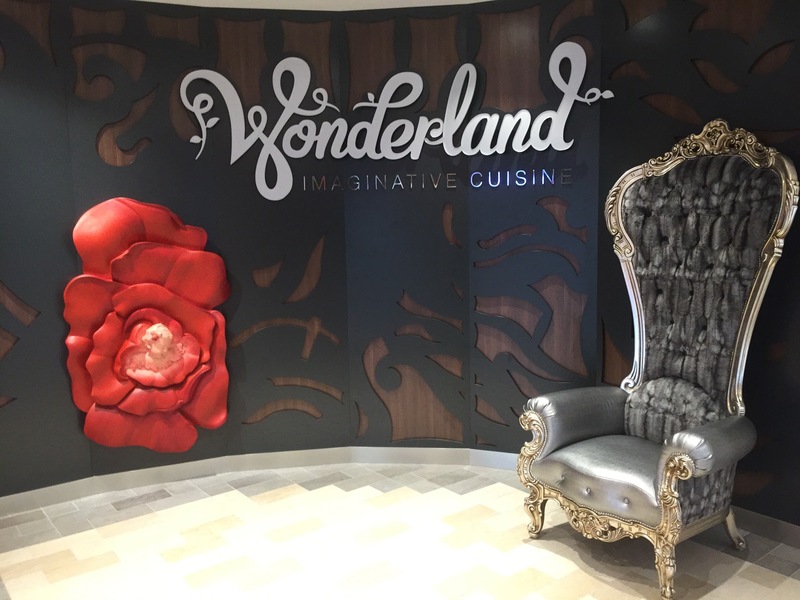 Personally I will try Wonderland when I bring my family on board, Wonderland is an Alice in Wonderland themed restaurant where you start with a blank piece of paper on an easel and you brush water onto the paper so the ever changing menu appears. 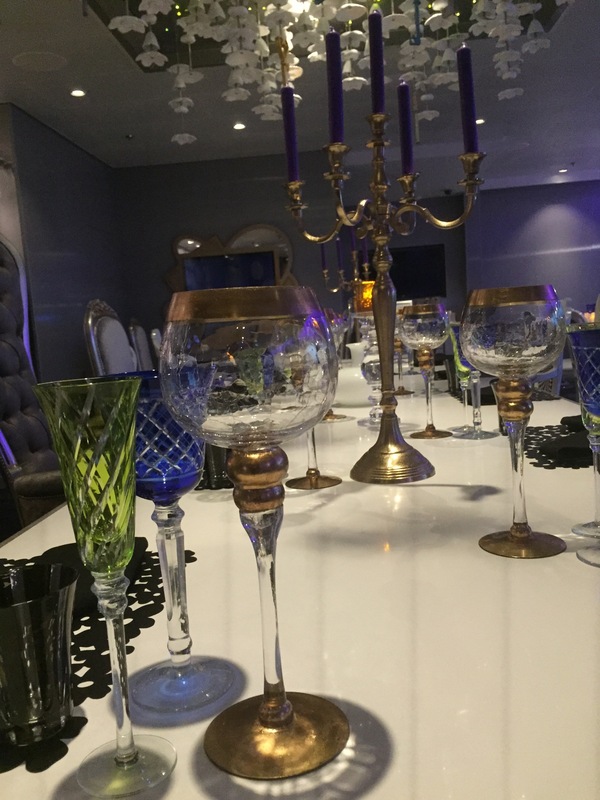 This is a small intimate restaurant where the furniture and cutlery contradict each other. Both the exterior and interior of Wonderland are stunning. 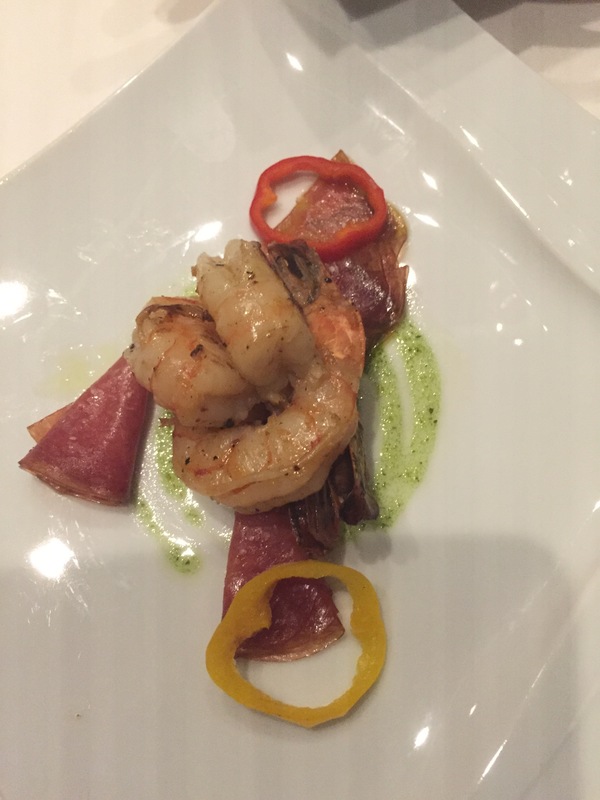 With so many dining options on Quantum of the Seas I was guilty of grazing through the day. 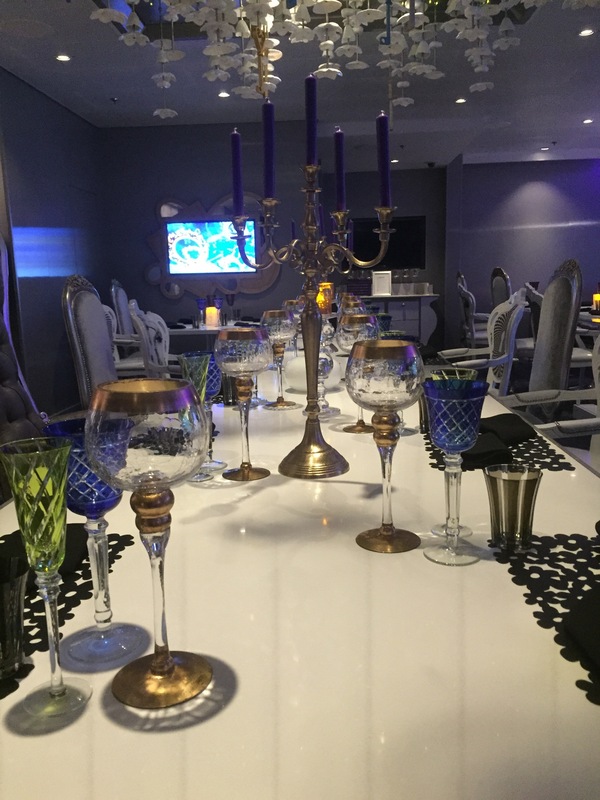 It was very easy to pop into Royal Caribbean’s signature snack areas like Sorrento’s Pizzeria or the Dog House which kept me fuelled to enjoy the Quantum Experience. Other casual dining areas include the Windjammer Marketplace, the cafe at Two70 and the cafe on the Royal Esplanade. I was surprised to find out that there are 4 additional restaurants included within the price, these are Grande, Chic, Silk and the American Icon Grill. I had the pleasure of dining in Grande and Chic. 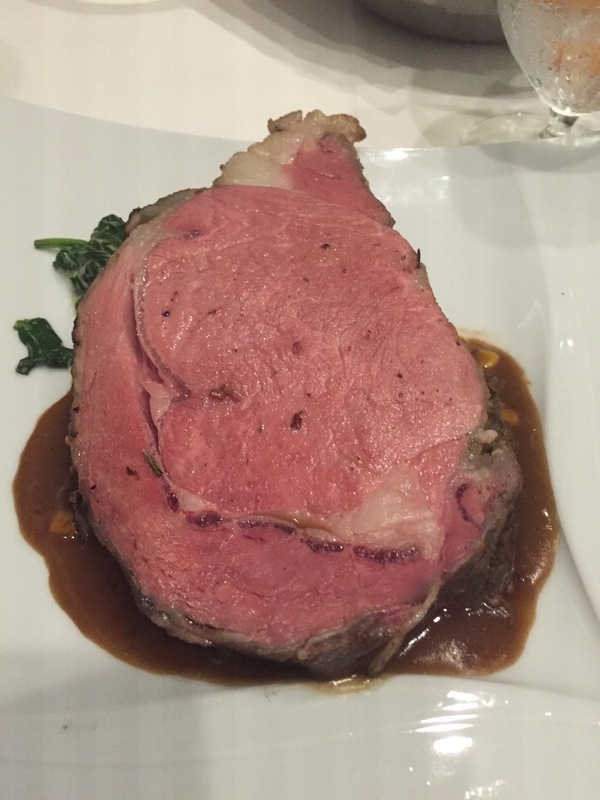 Grande is Quantum of the Seas formal restaurant with a stricter dress code, this is perfect for the more traditional guest and the beef tenderloin literally melted in the mouth. 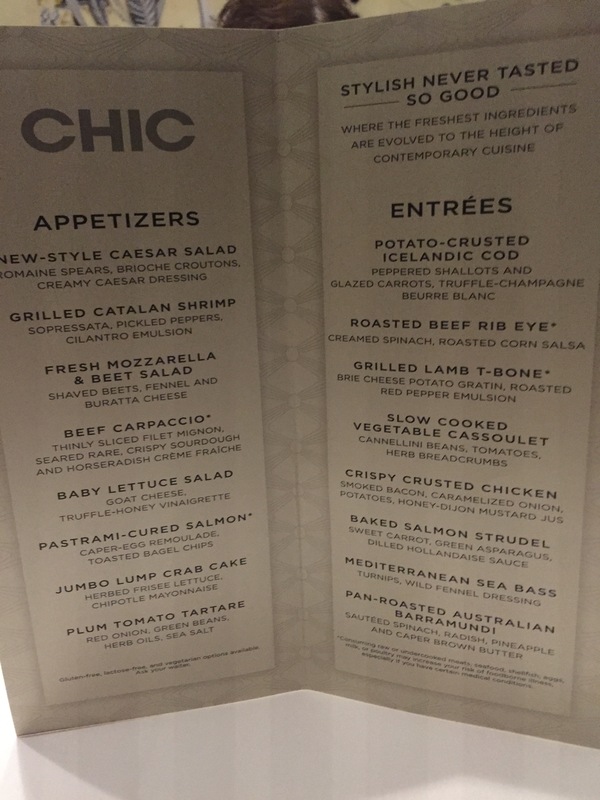 Chic was my personal favourite and I had to double check it was not a speciality restaurant. 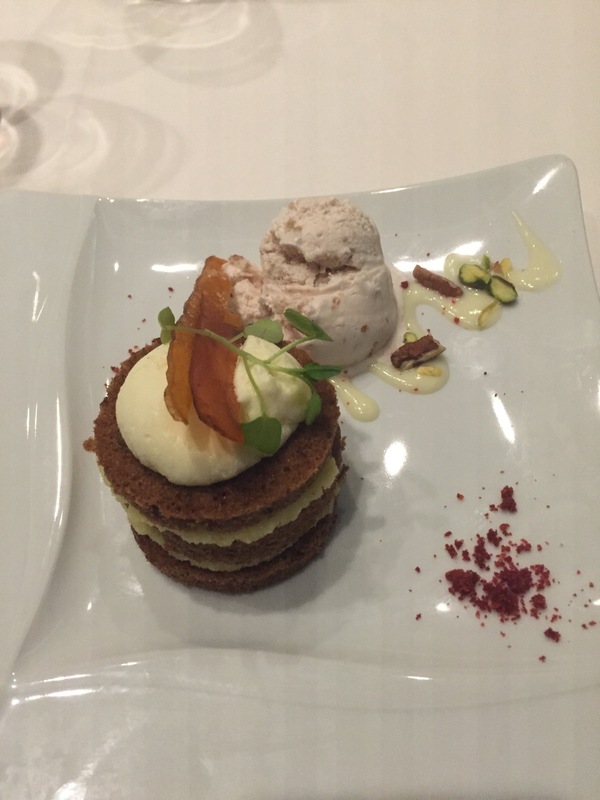 Silk is an Asian restaurant with fabulous decor and the American Icon Grill offer American classics with a twist. Personally I feel that Royal Caribbean have got the balance perfect so guests will not get bored with their dynamic dining options. 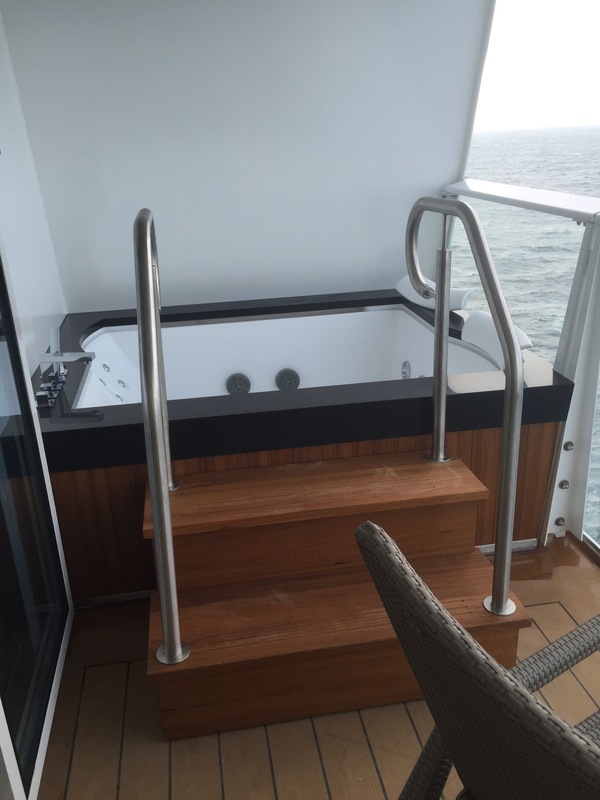 Whenever I go on a ship I’m always asked what are the top suites like and I am delighted to say the Royal Loft Suite on Quantum of the Seas is quite special. A two story open plan suite with a large bathroom and jacuzzi baths both in bathroom and on one of the verandas. Pictures say more than words so below are a few pictures including a panoramic picture and a view from the bed.